When we say 'weird' we mean it. Definitely. 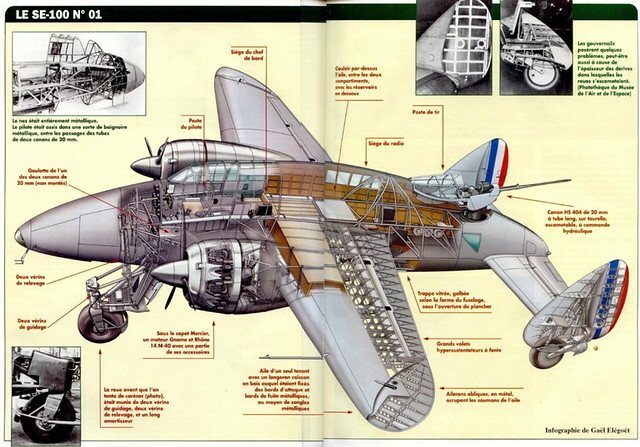 With the issue of a specification for a successor to the Potez 631 twin-engined fighter in service with the Armee del'Air, P-E Mercier and Jacques Lecarme of the Societe Nationale de Constructions Aeronautiques de Sud-Est (SNCASE) tendered the design of a highly innovative aircraft, the SE 100 (initially designated LeO 50). 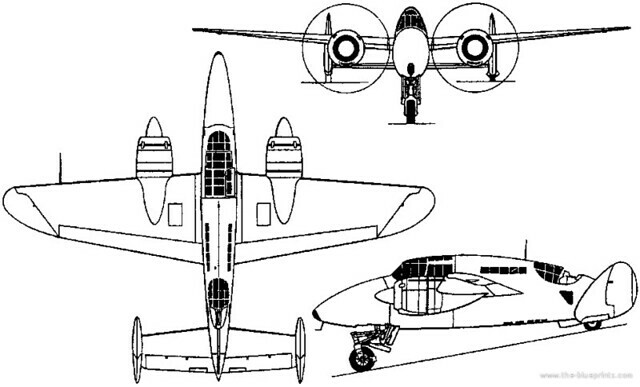 Of mixed construction with a wooden wing and a duralumin-covered welded steel-tube fuselage, the SE 100 featured a retractable tricycle undercarriage with a steerable nosewheel and small outrigger wheels retracting into the bases of the endplate vertical tail surfaces. Powered by two 1,030hp Gnome-Rhone 14N 14-cylinder radial engines, the first prototype SE 100 was flown on 29 March 1939. Various modifications, including provision of a retractable ventral fin, were introduced as a result of initial flight test, maximum speed being raised from 560km/h to 580km/h as a result. The proposed armament comprised a nose-mounted battery of four 20mm cannon and a single aft-firing cannon on an electro-pneumatic mount. It was proposed that the crew would comprise two members for diurnal operations and three members for nocturnal missions, and a crawl tunnel was provided between the cockpits. On 5 April 1940, during a landing approach, the pitch mechanism of the starboard propeller malfunctioned and the aircraft was destroyed. At this time, assembly of a second prototype had begun, this possessing slightly larger overall dimensions, dispensing with the crawl tunnel to increase fuselage fuel capacity and having an all-metal one-piece wing. Armament was also revised, the forward-firing battery being increased to six 20mm cannon, paired weapons of the same caliber being mounted in a dorsal turret and an additional 20mm cannon being mounted to fire through a ventral hatch. The Citroen factory in the suburbs of Paris began tooling-up to assemble 300 SE 100s for deliveries to commence at the end of 1940, but the German occupation of Paris prevented final assembly of the second prototype. Proposed variants included the SE 101 and 102 with 1,200hp Pratt & Whitney Twin Wasp and 1,050hp G-R14N-2/3 engines respectively. Needless to say, all further development has been halted and never resumed. Makes me think of that Bruce McCall drawing years ago of the plane with the curved fuselage that supposedly resulted from someone wrinkling the blueprints and not wanting to take the blame, so the plane went into production with the bent shape. LOL!